The first prize is a good one! 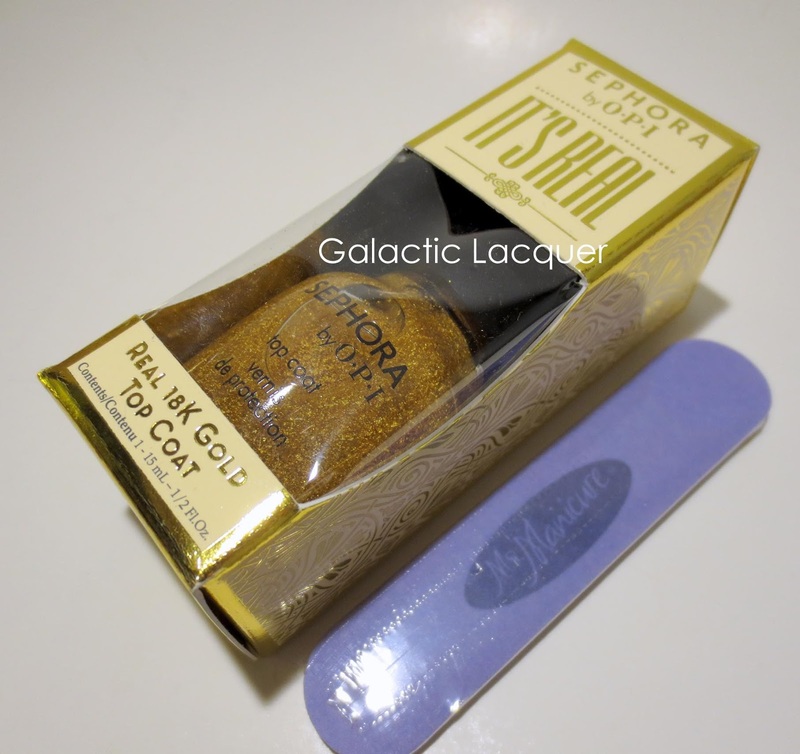 The first place winner will receive a brand new 18k gold topcoat from Sephora by OPI along with a mini nail file. The polish is new in the box, and looks absolutely gorgeous! The second prize is a set of four minis from 365 Days of Color. These are some of her neons, and they are super bright. The colors are Chemical Romance, Dangerously Beautiful, Killer Kiss, and Deadly Attraction. The winner will also receive one Sunny's Miracle Balm in tuberose scent (it smells like flowers!) along with a mini nail file. The third prize is a bunch of nail art goodies. 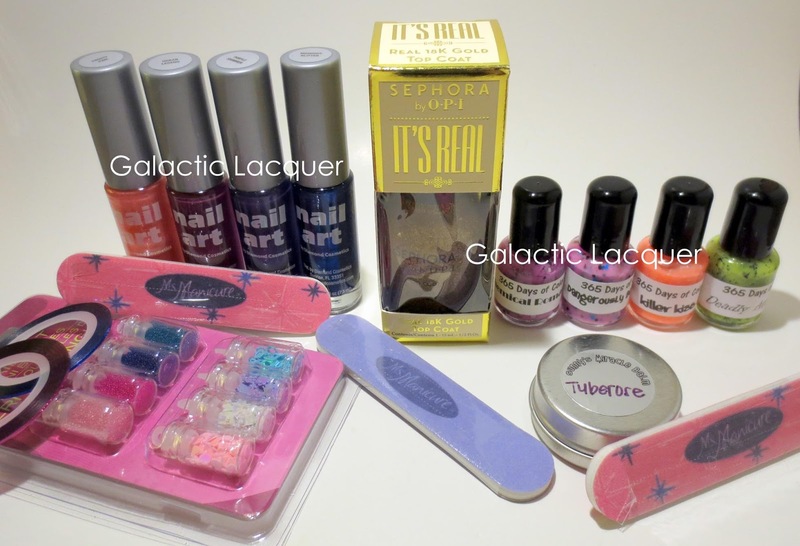 The winner will receive four nail art polishes in Frosty Pink, Urban Legend, Purple Shimmer, and Midnight Glitter. They will also get two striping tapes in pink and blue, a bunch of glitter and micro beads, and a mini nail file. You must be 18 years or older to enter or have permission from a parent. You must be a resident of the United States (including PR) or Canada. Sorry, this giveaway is not open internationally. All prizes have been purchased with my own funds. This is not a sponsored giveaway. If a prize is lost or damaged in transit, I am not responsible for replacing it, but I will pack it carefully and give you tracking information. This giveaway is not sponsored, endorsed, or related to Facebook. It is a blog giveaway for fun. You must enter using the Rafflecopter below. The giveaway will begin November 9th at 12:01 AM EST and end on November 24th at 12:01 AM EST. Winners will be drawn randomly via the widget. As much as I'd love the first prize, the second prize is really where it's at ;) But anything would be awesome! oooh that gold top coat! that'd look so good over a deep red for all the parties this winter! thanks for having such an awesome giveaway! The 18K top coat for sure! I would love any of the prizes. They all look awesome! I'd love to win the 2nd prize, full of those 365 Days of Color polishes! And of course, thank you for the giveaway! 3rd one :) or any!! Congrats Corrinne.. So happy you hit 1000 follower :) from 100 to 1000 boy we have come a long way... Really look foward to many more 1000s ~!! The gold topcoat of course! All 3 are amazing, but the third. All these are amazing but if I had to pick one I would pick #2!! Omg, the second one is supppppeeeerrrr awesome! Love Sunny's products and I don't own any of her neons. :D Thanks for the giveaway and congrats!!! Definitely the top coat - I love gold and turquoise together, and that's how I'd try it out! I have always wanted to try nail polish from 365 Days of Color! Congratulations on 1000 FB followers and thank you for the giveaway!! I need the gold, ahhhh!! GOLD MEMBA! Awesome Giveaway. I would love to win the 18k gold topcoat from Sephora by OPI polish. I'd love the gold top coat! I love the first prize! I want the first prize most. My favorite is prize #2! :) I've seen swatches & love the 365 Days of Color Toxic Love collection (esp. Dangerously Beautiful)! I would love the fourth prize because I've been dying to get my hands on some striping tape. OOOHHH gold! Almost better than diamonds. But second would be nice to. Love those indies. But third, hmmm, need more striping tape and can never have enough sparklies. Looks like I would be happy with any of them! I would love to try some of your polishes!!! I think I like Prize #1 the best. Ic ould never splurge on the gold top coat but I would love to win one! Thank you! id love the gold top coat!! it looks gorgeous! I'd love to win those 365 minis! Lovely. Any! I don't have any of the items listed above and they would all be amazing to add to my collection! Honestly, anything would be awesome, but I am really intrigued by the 18k gold topcoat!! Prize #2 but all of them are great prizes. Definitely the second place prize! I like all of it! Prize #2 is my fave even though they're all great! Ooh prize one of course!!! I like prize two too! All the prizes are great and I'd be happy with any of them, but if I had to choose, I'd pick prize #2! The 2nd prize looks so pretty! Gold top coat :D Or, well, any of them! Thanks for the giveaway and super big congrats on the followers! I like the third prize package the best. I already answered everything and completed all the tasks, but when I logged in today, I had to do it all over. Strange. This happened on all my rafflecopter entries. ?? i'd love to win the first prize! the gold topcoat looks gorgeous. Definitely #1 but #2 is tempting too cause I love Sunny's stuff! Wonderful giveaway! Congrats on the milestone! Wow, I love all the prizes! I can't decide if I want #1 or #3 the most, but they're all great! I think the gold topcoat would be awesome! I'd love Prize #1 but any one of them will be amazing! Thanks for the giveaway! My favorite is 18k Gold Sephora Topcoat! I see it all the time on instagram & I would love to have it! I would love number 1!!! Thank you for the great giveaway~!!! the 365 days of color polishes !!!!!!!!!!!!!!!!!!!! ! ! !!!! ! The set of four minis from 365 Days of Color - they look amazing! Prize 1 but I am becoming an indie fiend so prize 2 looks neat as well. Prize #1! i would just die if I won that! I would be happy to win anything since I have never won a Giveaway before. any prize would be wonderful, thanks! Second prize ALLLLLLLLLLLLLLLLL the way! The second prize would be my absolute favorite. While the gold topcoat would be nice to have....I am an 80s kid, thus I'm an absolute SUCKER for neon lol!! Thank you for this opportunity, and GOOD LUCK ALL!!!! The first prize is amazing! But what I really want, no need, is the 18k gold topcoat from Sephora by OPI!!! The 365 days of color pack! Thanks for such a great giveaway! Congrats!!! I'm most excited about the 365 Days of Color prize pack. I would love the gold top coat! i can't pick between the first and second prize! ahhhh!! hahahahaha. 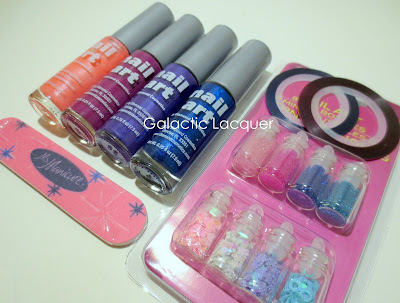 I would love the nail art stuff! I'de love prize #2! Congrats on 1,000!